Purchase online SIM800 Quad Band GSM/GPRS Serial Modem in India at low price from DNA Technology, Nashik. 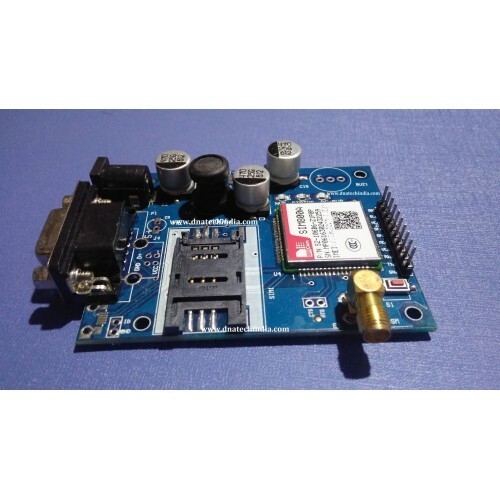 This GSM modem has a SIM800A chip and RS232 interface while enables easy connection with the computer or laptop using the USB to Serial connector or to the microcontroller using the RS232 to TTL converter. Once you connect the SIM800 modem using the USB to RS232 connector, you need to find the correct COM port from the Device Manger of the USB to Serial Adapter. Then you can open Putty or any other terminal software and open an connection to that COM port at 9600 baud rate, which is the default baud rate of this modem.Once a serial connection is open through the computer or your microcontroller you can start sending the AT commands. When you send AT commands for example: "AT\r" you should receive back a reply from the SIM800 modem saying "OK" or other response depending on the command send.